Welcome Everyone to the Traveling Art Shack!! Where we present quality, nurturing, educational & whimsical art lessons for children to blossom forth through creative exploration! 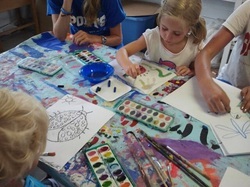 We also host Birthday Art Parties/events and seminars for children, teens and adults traveling around NYC!! Imagination, curiosity, exploring infinite possibilities and go into the unknown trusting your intuitive nature!! This is what the Traveling Art Shack encourages, meeting each person where they are at in life. To gently guide with respect to each individual's desire to blossom to their greatest artful potential in an endearing, nurturing and fun exchange!!! We are all naturally gifted with exploring creativity in life. By engaging ourselves through various art modalities we become receptive to the tapestry of wonder that surround us. We allow the gift to broaden our horizons and make connections creating from our heart with inspiration on our evolving path! Take a journey with Traveling Art Shack and enjoy the artful ride!!! "Logic will get you from A to Z; Imagination will get you every where!"